What happened to WordPress’s Form Response? A few years ago WordPress added a useful form response feature — you could add a response form to the end of a post, people would fill in the information, and the information would be sent in an e-mail. It saved them the hassle of having to compose an e-mail message to the blogger on whose blog the form appeared. It was very useful for people who did not want to respond in a public comment, but wanted to discuss the matter in the blog post further. I found it easy to import the responses into a database without retyping (which brings dangers of typos). Then WordPress began adding HTML to the responses. That was a bit of a hassle, because I’d have to save it, and strip out the HTML before it could be used. Now they seem to have farmed this out to something called POWr, which is completely unusable. I just don’t have the time or the inclination to jump through all the hoops they want me to jump through. They don’t send the information in an e-mail. They send a link to a web page that is so full of lazy HTML and other unreadable spammy stuff that it invariably gets tossed into my spam queue. This is your 2nd submission this month. Your plan allows for 25 submissions every month. Click here to upgrade your account and receive more submissions. Have you tried the new POWr Chat? I must have deleted lots of them without noticing, because the subject line “How do you prefer to communicated?” gives no indication at all that this as a form response from WordPress. And then again, if I do happen to notice it when I’m bulk-deleting my spam, I find I have to click on a link to a web site so I have to wait for a browser to load up and then they want me to sign into a web page, which means looking up in another program to find if I have a user name and password for that particular site. If I could, I’d remove all the “Form Response” thingies from all my blog posts, as they are now useless, but that would be extremely time-consuming and difficult. So if you see a response form at the end of any of my blog posts, please don’t be tempted to use it. Just send me an e-mail instead. Why do people provide something simple and useful, and then replace it with something complex and useless? Whose idea was it to fill WordPress blogs with illegible fonts? The Facebook world is very much a Web 1.0 world. Th l l ll i i mu h i l i l l.
The vertical strokes in the letters are visible, horizontal strokes are faint, and diagonal strokes fainter still, so that in a word like “Facebook” all one can see are the vertical strokes of the b and the k, which make the word look like ” l l”. The blog post in question was Church in a Facebook World | Liturgy, where the blog says that it is “Powered by Headway, the drag and drop WordPress theme”, but most of WordPress’s public and help pages seem to be written in the same barely legible font. The list of Categories in the right column where I am writing this are in the same illegible font. I really couldn’t be bothered to read most of the comments on that blog, because peering at the screen trying to work out what the words are leaves one so exhausted that it isn’t worth bothering to think of what those words are trying to say. These are not the Dead Sea Scrolls or some other ancient documents that have to be deciphered after being exposed to the vagaries of the climate, insects and other hazards for thousands of years. Why make text on a computer screen look like a badly-fixed paper photograph that has been left out in the sun? You can surely devise fonts with a face and colour that contrasts enough with the background to make them legible. So why do the people at WordPress seem to go out of their way to make them hard to read? Are they trying to kill blogging? This blog is eight years old today, and here is a link to the first post. But WordPress is taking so long to load that it might be tomorrow before this gets posted. That is actually on the old site, where this blog started. I moved it from Blogspot here to WordPress about a year ago when Google crippled the Blogger editor, removing lots of functionality and making it much harder to use. But I left the old one up, so that links to and from it would still work. I wish people who abandon their blogs would not simply delete them, because deleting them creates a lot of broken links on other blogs. I’ve found that some of blogs that I used to read regularly have disappeared from their usual places, and reappeared on something called Patheos. You go to their main page, and you find “Editors’ Picks”, but nothing to tell you who the editors are, or why they have picked what they pick. There doesn’t seem to be any “About” page to tell you what the site is for. But it seems to be a kind of vacuum cleaner, sucking in blogs from all over. The masthead says “hosting the conversation on faith”, whatever that may mean. You have asked Firefox to connect securely to cp.patheos.com, but we can’t confirm that your connection is secure. Normally, when you try to connect securely, sites will present trusted identification to prove that you are going to the right place. However, this site’s identity can’t be verified. If you usually connect to this site without problems, this error could mean that someone is trying to impersonate the site, and you shouldn’t continue. Not very reassuring, but I’m still curious about why some bloggers have apparently moved their blogs to there. For several years now Amatomu has been the most useful guide to the South African blogosphere, but for the past couple of years it has been behaving erratically, and now it seems to have disappeared altogether. Firefox can’t establish a connection to the server at http://www.amatomu.com. That is sad, because now the only real guide to South African blogs that I know of is the blogrolls of other South African bloggers, and those, including my own, are often poorly maintained. But perhaps blogging is dying anyway, and internet communication is becoming more and more trivial and inconsequential. And most of that schlock finds its way on to social media sites like Facebook nowadays. And yes, there were (and probably still are) blogs that are just as bad, but they weren’t quite as “in your face” as Facebook. So, I’m sorry to see the death throes of Amatomu. For all its faults, it did serve a useful purpose. Is someone tampering with blog stats? There’s something weird going on with blog stats. 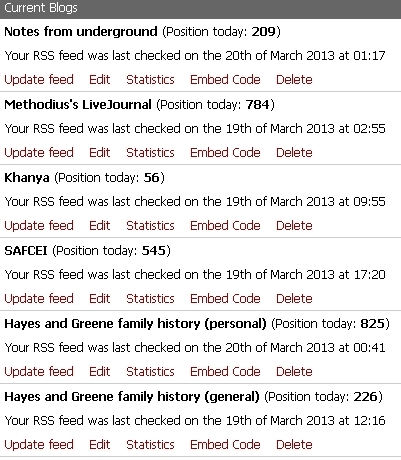 Yesterday our family history blog, Hayes & Greene Family History, got its highest number of daily visitors ever — 252. I didn’t post anything special yesterday — in fact I posted nothing at all, so there doesn’t seem to be any particular reason for the sudden rush of visitors. But there was something else that was even stranger. I did post something on our other family history blog, on Blogger, rather than WordPress, and I happened to notice, when I updated it on Amatomu, that its ranking on Amatomu was higher than that of the WordPress one, which was a bit unusual. Ususally the WordPress blog fluctuates in the Amatomu rankings between about 220-250. But this morning it was down to 285, and now it is down to 816, on the very day that it seems to have got the highest number of visitors. The Blogger family history blog is usually somewhere in the 300-500 level, but yesterday it was suddenly up around 220. The question I have is: why there such an extraordinary increase in the number of visitors on a single day, and why should it be accompanied by such a huge drop in the rankings, from 280 something to below 800? The only way that could happen is if someone is manipulating the blog stats, and doing so in two different places — on WordPress to exaggerate the number of visitors, and on Amatomu to lower the rankings. If anyone else has a better explanation, please let me know. But I am more than ever convinced that blog statistics are completely unreliable and worthless. Technorati will need to verify that you are an author of the blog by looking for a unique code. Please put the following short code 5855T3M6ZVUB within a new blog post and publish it. This code must appear in the published post and it must also appear in your corresponding RSS feed once published. So there’s the code they asked for. …a Top Christian Blogs list with a difference. This list is ranked by another measure of influence that as far as I can see the other lists dont measure: Number of Twitter followers. Interestingly I found almost nobody in the top blog lists who didnt also Tweet, and the vast majority of them post all their blog posts as links to their Twitter feed (usually automatically). If you run a blog and don’t do that yet, its time you sort that out! I find that rather odd, because I’ve never found a blog that tweets. Bloggers tweet, yes; but blogs, no. At least not in my experience. And that made me wonder how people use Twitter. I do follow a number of bloggers on Twitter, because I read their blogs, and want to know when they have posted something new. Similarly, I sometimes, but not always, tweet when I’ve posted something new on one of my blogs. But I tweet about lots of other things, and I’m sure a lot of people who follow me on Twitter never read my blogs at all. So I find it strange that one could measure blog popularity by the number of Twitter followers. And what makes a “top Christian blog” anyway? According to Amatomu (when it works), the “top” South African religious blog is a thing called Discerning the world which seems to specialise in venomous attacks on people and churches that the blogger doesn’t like. What she never bothers to tell us, though, is what she does like. Oh, and Adrian Warnock mentioned the absence of female bloggers in many “Top Christian blogs” lists. Well adding Discerning the world should help to remedy that deficiency! I’m not sure how Amatomu calculates top blogs either. One that ranks consistently high is Dion Forster’s old abandoned blog, Dion’s random ramblings, which his current blog, An uncommon path, somehow never quite manages to catch up with. Unlike @grahamdowns, whom I also quoted above, I don’t follow people on Twitter because I don’t know them or because I do know them. I follow them because I think they might tweet about stuff that interests me, whether I know them or not. And I often keep caught up by means of the daily digest of tweets, though its criteria for what is interesting don’t always coincide with mine. But that was how I found Adrian Warnock’s post in the first place. What I find interesting, and use Twitter to help me to find, is not so much blogs as blog posts on topics that interest me. And for that Twitter is most useful if the tweets use hash tags. Adrian Warnock recommends Twitterfeed as a way of automatically notifying Twitter etc of new blog posts. But does Twitterfeed know how to use hash tags? (And, incidentally, that’s one reason I find blogs that ask you to log in before letting you comment annoying. Having to register to post one comment on one post that you find interesting seems a waste of time). I use hash tags a lot to find tweets by people I don’t follow on subjects that interest me, and some of them, like #missiology, even produce a daily paper if enough people tweet on it. This blog was hosted by Blogger from 2005 until 20 September 2012. The foisting of the new user-hostile Blogger interface on users was the last straw, so I’ve moved it to WordPress. Not only was the new interface harder to use, but it seemed that a lot of the old functionality has been lost. WordPress was always better for posting graphics than Blogger, but now it seems that the graphics capabilities of Blogger have been reduced still further, so it doesn’t seem to be worth continuing. I started this blog towards the end of 2005, when Blogger was much easier to use than LiveJournal, though I still occasionally post stuff at LiveJournal. Then when they began messing around with Blogger on a previous occasion a lot of people moved to WordPress, and I started another blog on WordPress, just to be on the safe side. It was called Khanya, and it has now become my main blog, as it gets about twice as many readers as this one. For many years I posted to both blogs, depending on the requirements of the post, and the relative strengths of Blogger and WordPress — each one had its own strengths and weaknesses. But the latest changes are just too much, and it doesn’t seem to be worth continuing. I’ll leave the old Blogger version of this blog there for as long as Blogger is willing to host it, because there are links from other blogs and web sites, and I’d prefer not to break them. Broken links are one of the annoying things about the web, and I don’t want to add to them. But any new posts will be added here, or on my Khanya blog, once I’ve worked out how to distinguish them, now that they are on the same blogging platform. forward to hearing from you soon. To begin with I just deleted them, but then they started sending me reminders, and asking for my response. So I replied to a couple of these reminders, and asked for a sample of their proposed guest posts, and there was no response to that at all. Has any one else been getting these offers? Why would people offer to write a guest post, then remind you of the offer, and then when you take them up on the offer and ask to see the guest post, just not respond? Are these people who have so much time on their hands that they have nothing better to do than waste other people’s time be generating needless correspondence? Or are they just harvesting e-mail addresses for the purpose of spamming? If that’s the case, it seems a lot of trouble to go to — to insert the name of the blog and all. Or is it some kind of hidden scam, like the messages I used to get a year or so ago inviting me to a conference in some US city and in Dakar, Senegal? After getting several of those, I tried to find more about what it was about by sending enquiries asking for further information about these conferences, but none was forthcoming. I assume that the conferences were all bogus, but I wonder why someone would go to the bother of sending out invitations to bogus conferences. They don’t seem to be looking for any kind of response, because they never respond to the responses. Another similar thing seemed to come from one persistent guy who called himself or herself Laure Norman. He said he had important information for me. Eventually I asked what the important information was, and the reply was that the important information was that there was important information. In the end I set up my e-mail program to simply bounce back anything received from that source, and I now see that my ISP (whose addresses this “Laure Norman” impersonated) is now marking it as spam at the server, so it never reaches me. What puzzles me about all this, though, is what’s in it for the people who do it. They’re not asking for money, so there is no obvious scam involved. Does it give them some kind of satisfaction to waste other people’s time and bandwidth?